Hi GZoners - thought I would pick your brains about UFB provider options in Whanganui. I am shortly moving to a new property which, as luck would have it, is connected to UFB. Current residents who are the owners have Orcon. I have read the posts here on GZ which were useful. (2) Inspire (have looked at 100GB. VOIP calling, 100/50Mbit) also $125 a month. Doesn't say whether fixed IP available or not. Also unclear if modem/router provided from my initial readover. Anyway, I currently use Roku over TCL using Unblock-US, occasionally video conference for work etc. I use static IP mostly to make it easier to get access to my home NAS and systems to be honest as I am not overly network savvy. Interested if there are any likely pitfalls with Roku in particular by swapping over. I want to retain my current email with TCL as have been with them for ages and its a pain in the posterior to changeover to a new ISP's addresses. I am not waiting for them to deploy UFB here in Whanganui though. Just interested in your views of the two providers whether in Whanganui or elsewhere in NZ and who you would go with and why? You can definitely keep your number if you come to Orcon. As to who is the best ISP, I couldn't possibly comment :) But we would love to have you as a customer. We're offering a router as part of the UFB package at no extra cost, and connection also comes with a fixed IP at no additional cost. For $40 we can also port an existing phone line over to InSPire VoIP. If you're interested or have any questions just give us a call on 0800 484 363 and we can get an application underway. There's also the local ISP http://ubergroup.co.nz/ who are apparently good. Ragnor: There's also the local ISP http://ubergroup.co.nz/ who are apparently good. Inspire all the way. We use them for all UFB and Wireless connections and they are absolutely superb. You really won't find better customer service anywhere. 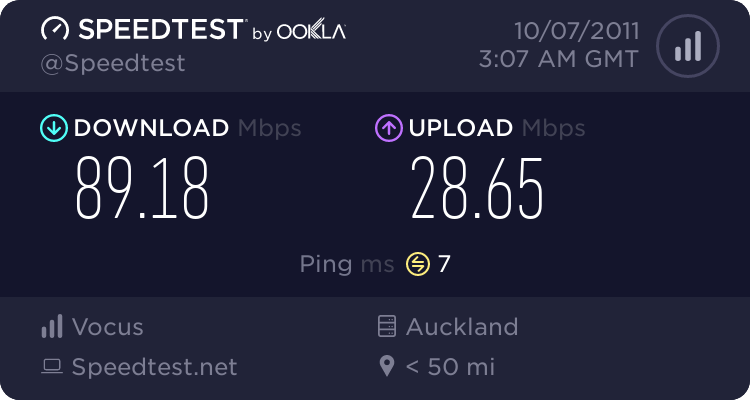 Latency within their network is excellent as well so if you have friends in Palmy/Wanganui gaming and the like will be really good.